Southeast Asia is one of the most popular destinations for tourists in the world. This corner of the Asian continent is big and diverse offering many great activities for everyone. Natural beauties, fascinating landmarks and many cultures are assets that Southeast Asia has in abundance. Cambodia, Vietnam and Laos are especially rewarding in this regard. These countries are very popular among backpackers. Affordable lodging, cheap transport and endless friendliness of the locals are faithful companions to members of the backpacking community. So is planning essential in many things in life, including travelling. Let’s find out how you should plan a Vietnam, Cambodia, and Laos backpacking tour. Laos: there is something special about Laos that we just love. If you’re looking for a bit more authenticity and calmness than Laos is the place to visit. Laos lacks iconic sights. There is nothing necessarily epic that draws people to it. Laos is a paradise for backpackers, offering satisfying backpacking experience, irresistible gastronomy, undiscovered wilderness, spell binding scenery, mysterious river village and adrenaline pumping adventure activities and budget friendly travel option across the country. Laos is the destination for adventurers. Thanks to its pristine jungles and Karsts mountain landscape. It is the best country in mainland Southeast Asia for hiking and trekking. It’s also an excellent place for other outdoor activities like kayaking, zip-lining, carving and rock climbing. The standard backpacker route through Laos includes Lang Prabang, Vang Veng and Vientiane. These towns offer excellent western Style accommodations and restaurants. Activities for backpackers: admire the beauty of Kuang Si waterfall one of the prettiest waterfall of Asia. Take a ride in a hot air balloon in Vang Vieng and swim in the secret Pool at Kuang Si the most famous waterfall. Chill in a hammock at Si Phan Don: No backpacker’s trip to Laos is complete without some major chill out time on 4000 islands. Choose a village home stay or stay at Mekong riverside bungalow. Vieng: Explore the caves, blue lagoons, tube down the river or go Zip lingo by day and then party the night away in this backpacker haven three hours north of Vientiane. Join a cooking class in Luang Prabang and learn how to cook some Laotian delicacies. Laos is not cheap to travel as Thailand or Vietnam but by staying in hostel and eating local food you can save on that. The local currency is the Lao Kip; however Thai Baht and USD are also widely accepted. Laos is a special place where you’ll long to return to. Cambodia is a fun and cheap destination for backpackers. But what really make it an enchanting destination to visit are its beautiful friendly people. The ancient mysterious and breathtaking vine clad temple complex of Angkor Wat is one of the most mesmerising sights you will ever set eyes upon. Such is the rustic beauty and appeal of Cambodia that once you backpack across it mystical terrain a part of your soul never leaves from there. Start off at Siem Reap and take a self tour at Angkor Wat: You can also take the Angkor wat sunrise Tour. The place contains the magnificent remains of the capital during Khmer empire dating from the ninth century. Move out before dawn to catch the sunrise behind the site’s most famous temple. Kampot is a laidback river town for those seeking a vacation. Book a riverfront hostel, open a can of Angkor beer and watch the world for by. Adventurous tourist may hire a motorbike and head up towards the Bokor Mountain. Koh Rong Samloem is a perfect postcard tropical island. It is a home to simple beach huts and swathes of untouched stretches of white sand. This island also boasts of translucent turquoise waters perfect for snorkelling. Ride the bamboo train: another unforgettable experience that sits in Battambang is the bamboo train. The train is made up of a small bamboo platform covered with a mat and a few thin cushions to sit on. This sits on two sets of bogies with a simple motor at the back. A wooden pole is used as both the brakes and accelerator with the train hitting speeds of up to 50km/hr a truly exhilarating experience. Visit the exotic markets and night markets in Phnom Penh. Vietnam is easy to explore with a backpack with a super efficient transport including public buses and easy to use train. Rich culture and currency makes you feel like a king. Vietnam is a paradise for backpackers. If you are seeking epic adventures, unique experiences, mouth watering foods and ancient historical sites, glistening pagodas, lush rice paddies, magnificent limestone rock formation, amazing caves, bustling food markets, idyllic mountains, shimmering coastlines that’s Vietnam for you. Many travellers opt to explore Vietnam by motorcycle which is the best way to get around if you have plenty of time. Hanoi is the chaotic capital of Vietnam. It is a great place to start your journey or end it, depending on whether you plan your backpacking trip from the north to south or vice versa. Hanoi also home to the famous water puppet show .The city has many attraction to see, most of which are lakes, pagodas and museums and of course the Old Quarter. Make a trip to the country side of Sapa where you can ride your motorcycle through the hills and explore waterfalls. 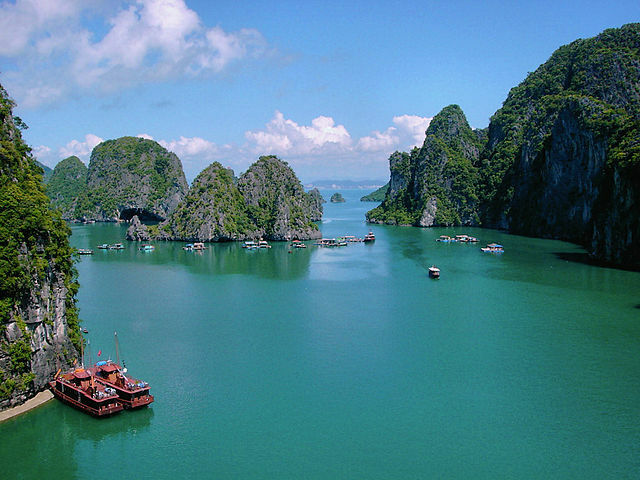 Arrange a trip to Halong Bay being a highlight on any Vietnam trip. Shop in the quaint town of Hue to Hoi an, where you can get an affordable, good quality suit made. Then go to Nha Trang to let loose, feel a bit wild and have some fun on the water. A popular water sports area with the likes of windsurfing, paragliding and jet skiing on offer. There’s enough of adrenaline here to keep the most adventurous happy. Party at the clubs or bars at Nha Trang beach. Munch on Vietnamese cuisine especially the lip smacking street food. 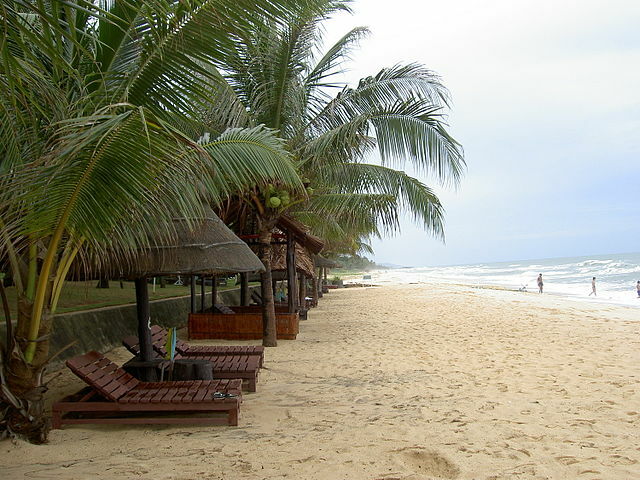 Make a trip to Phu Quoc Island and discover its immaculate beaches. Mui Ne is a great place to go kite surfing for its strong waves on the shore but very good wind for all water sports. So while planning your Vietnam, Laos, Cambodia backpacking tour you don’t need to book a return flight, since the prices of 2 one-way flights are similar to those of return flights.